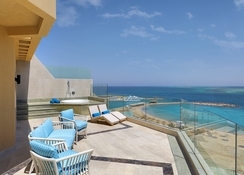 Hilton Hurghada Plaza is a luxurious seafront hotel that offers all-inclusive boarding option. Mostly visited by people looking for a relaxed holiday in Egypt, the hotel’s best feature is the proximity to the beach and the facilities. This family-friendly hotel is also an award winning hotel that features a mini club. 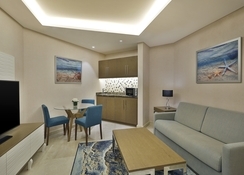 Accommodations in Hilton Hurghada Plaza are divided into six categories, broadly guestrooms and suites. 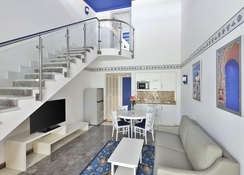 It is equipped with 220 rooms in today, all furnished with modern facilities and amenities. Different room offers different facilities, but something common you will find air conditioning, TV with satellite, telephone, safe deposit box, en suite with bath amenities, complimentary toiletries, hairdryer, mini bar, WiFi internet, sofa bed and more. 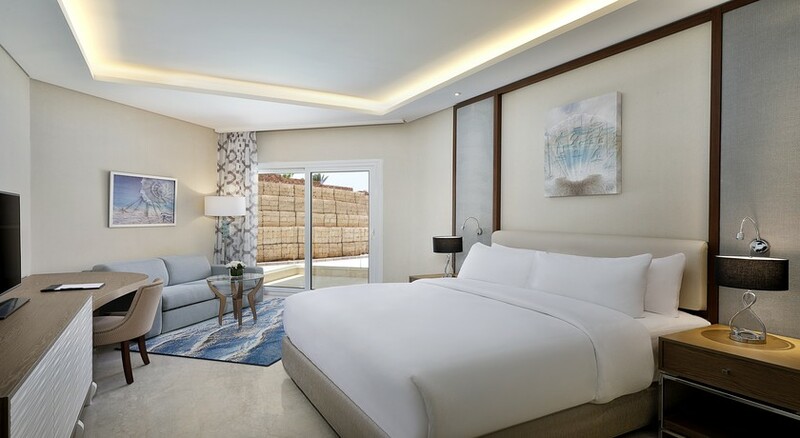 You can select between rooms that offer double bed and twin beds—you can request for housekeeping, extra bed, crib, wake-up call, laundry service, room service and more. Even otherwise, maid service and fresh towels and linens are provided daily. The hotel features nine restaurants and bars. La Gourmandise is the buffet restaurant that serves breakfast (7am to 10:30am), lunch (1pm to 3pm) and dinner (6:30pm to 10pm). Also, Jasmin restaurant opens from 7am to 11pm and serves all three meals, so does La Gourmandise restaurant from 7am to 10:30pm. Ideal for lunch Seashell Beach Restaurant (1pm to 5pm) and Mosaic Bar Restaurant (4pm to 6pm) serve delectable snacks and light meals. And speaking of its bars there is Beach Kiosk Bar (10:30am to 6pm), Club 35 ( 10pm to 3am), Plaza Bar (24/7), Pool Bar (10:30am to 6pm) and Shisha Corner Bar (10am to 12am) where you can have various signature cocktails and mocktails and local and international liquors. The hotel also boasts a large outdoor swimming pool that comes surrounded by loungers and parasols. You can play water polo, water volleyball and water gymnasium—approach front desk for lilos and beach towels. You can visit Planet Spa to rejuvenate—between 9am and 9pm—there is a fitness centre too. You can look forward to tennis table, billiards, squash, mini golf, volleyball, boccia and football, tennis court, darts and other recreational facilities. There is a kid’s club—10am to 7pm. 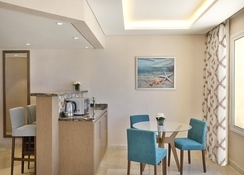 Meeting room, babysitting service, beauty salon, car rental desk, gift shop and recreation desk are also available in the hotel—in the evening, the hotel organises various games and lively events. 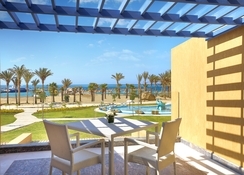 Located about a stone's throw away from the beach, Hilton Hurghada Plaza is a five-star hotel in Hurghada. 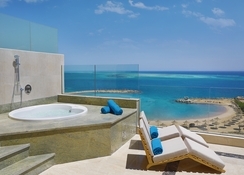 This luxurious property is mostly celebrated among couples, families, group travellers and honeymooners. Distance to Hurghada Airport is about 17 km from the complex—courtesy bus is available at the airport. The resort centre is a paradise for water sports lovers as it makes snorkelling, sailing, windsurfing, scuba diving and other motorised and non-motorised water sports activities possible. Few kilometres away from the hotel you will find shopping complexes, old markets and dining areas—you can board a minivan.